Nordea Bank have moved a main office out of a building in the centre of Copenhagen on the south side of Knippelsbro - the main bridge between the city centre and Christianshavn at the centre of the harbour - and are now in a new purpose-built block about 2 kilometres further south … close to the concert hall, studios and office buildings of the Danish Broadcasting Corporation at DR Byen. This building, their old office by the bridge, dates from the late 1950s and was constructed as the headquarters of the shipyard of Burmeister & Wain. After they closed around 1990, it was taken over by a series of banks … presumably, in part, because of the convenient size of the building and possibly, in part, because of the proximity to the National Bank of Denmark; to the headquarters of the rival Danske Bank and to the buildings of parliament and the main government ministries over the harbour just on the other side of the bridge. Now an application has been submitted to the planning department to convert the office building to a hotel to be run by the Hilton Group. The building is set back from the road but on a high base or terrace with an ugly high and blank concrete wall along the public pavement that runs down from the bridge to the level of Torvegade - the main road from the bridge, through Christianshavn to Amager. An initial proposal seems to be to break through this wall with windows and presumably an entrance into the hotel - which is good if it creates a less grim and forbidding frontage onto the pavement - and there are also proposals to open through from this lower level through to the harbour quay. At the moment there is no public route for pedestrians to get down to the quay directly from the bridge on this side although there are steps down on the other side of the road and steps down to the quay on both sides on the city side of the bridge. The only real objection to this would be if the hotel gains - by making the quay part of its domain or, at least, part of its facilities - but the citizens gain little in return. But really the big problem - and it is literally about being big - is that the current proposal is to add at least another floor on top of the building. It is already a massive block of a building nearly 100 metres, along the street, and about 34 metres deep with seven main floors above that concrete base and, of course, a certain amount of service works on the flat roof for air con and lifts and so on. Why does the hotel need even more floor space in a huge building that already dominates this part of the harbour and dominates not in a good way? If it is simply for roof-top restaurants then should local people object to tourists admiring the roof scape of the historic city as a pleasant backdrop as they look out but with the building dominating the skyline even more for those walking past or living nearby? In terms of the historic townscape, the real problem is if additions to the building undermines the setting of Christians Kirke and its forecourt and churchyard immediately to the south or dominates and disrupts the buildings along Strandgade … both the historic buildings immediately opposite the narrow end of the building away from the harbour or it dominates or undermines the streetscape from further north from the other side of Torvegade. 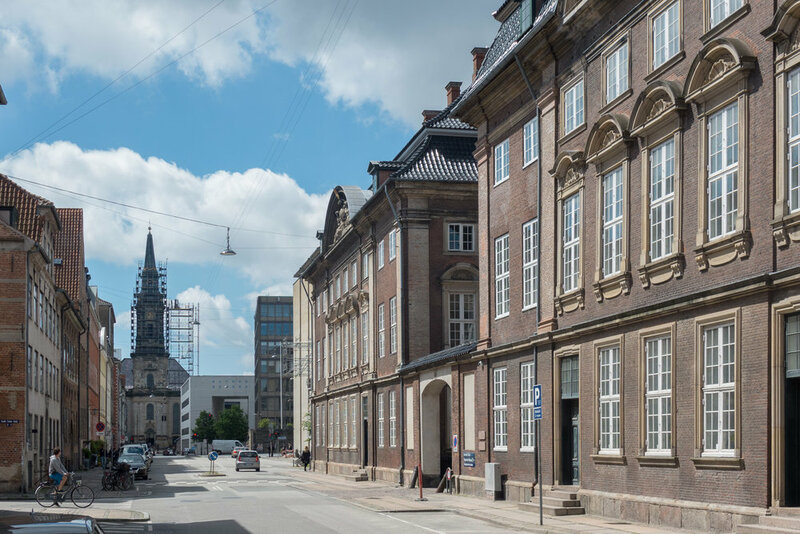 Strandgade is still, despite losses, the finest group of 17th and 18th-century merchants houses and warehouses in the city and not only its buildings but its wider context should be protected. It is important to note that when the shipyards closed in the 1990s, the large site that had been engineering workshops and yards was redeveloped with new offices along the harbour and new apartment buildings along the two sides of the site that face towards the canal but the architects Henning Larsen had to respect the level of the cornice of the church - so the distinctive roof and tower of the 18th-century building designed by Nicolai Eigtved were not compromised. It is a pity that the planning restrictions in the 1950s were not as sensitive but surely adding a floor to the building could not mean that two wrongs make a right … or at least in terms of the townscape and roof scape of the city. Strandgade looking towards the church with the corner of the grey and glass box of the Nordea / Hilton building just visible on the right. 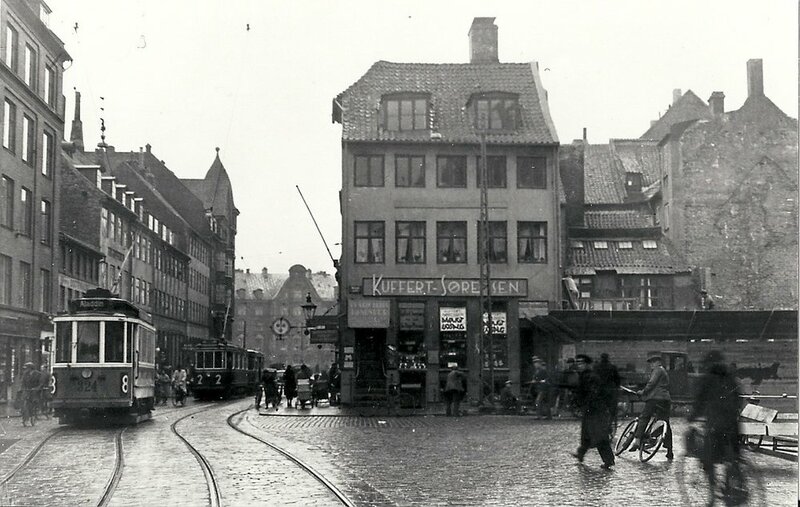 This is at the junction where Torvegade, running out from the bridge to the right, crosses over Strandgade and continues on to the left across Christianshavn and on to Amager. One more floor on a large building does not sound excessive but it changes further the dynamic of the street scape and emphasises even more just what a large hole was punched through Strandgade when 17th and 18th-century buildings were demolished to widen Torvegade and to build the approach ramp up to the bridge. It might seem odd to worry about a streetscape that was so drastically altered in the 1930s but the photograph below shows the run of historic buildings that run right up to the church on the opposite side of the road to the hotel. These are of huge historic importance to the city and at the very least deserve respect.